Perfect for breakfast or tea time, the classic ceramic mug! A lovely ceramic mug in a classical shape, perfect for breakfast or tea time. This product resists to microwave and dishwasher. Dots: a nice red colour with little white dots. 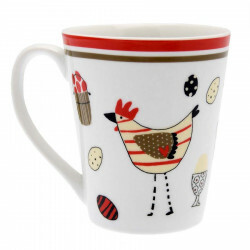 Hen: a white mug with a black chicken on one side and a white on the other side. Colourful and modern, these little chicken with their eggs will bring joy in your kitchen!